Goals from Wayne Thomas - his first in four years - and Rickie Lambert fired Southampton into the Johnstone's Paint Trophy southern area semi-finals. Saints began well and Thomas opened the scoring from six yards early on, before Michail Antonio hit the post. Southampton's second came in the 63rd minute when Adam Lallana created room for Lambert to crash home his 12th of the season from the edge of the area. Leon McKenzie's late finish from close range was not enough for Charlton. "We didn't have the problem that Charlton had with a two-day turnaround so it was good for us. The game fell nicely, we were the strongest side and we won. "[Thomas] has had a tough run with injuries and it was nice for him to score a goal after all the work he's put in." "In the first half we lacked a goal threat but we didn't want to risk Deon Burton with his groin problem and Leon McKenzie on his way back from injury, so we didn't have too many options. "I thought the lads stuck to the job, worked hard, and in the second half we were more of a goal threat. "If the goal had come 10 minutes earlier we might have got back in the game." 90:00+3:30 The referee signals the end of the game. 90:00+1:02 Assist by Luke Holden. 90:00+1:02 GOAL - Leon McKenzie:Southampton 2 - 1 Charlton Leon McKenzie finds the net with a goal from close in to the bottom right corner of the goal. Southampton 2-1 Charlton. 90:00+0:45 Kelly Youga takes a shot. Comfortable save by Bartosz Bialkowski. 89:17 Foul by David Mooney on Radhi Jaidi, free kick awarded. Bartosz Bialkowski restarts play with the free kick. 88:48 Jacob Mellis gives away a free kick for an unfair challenge on Matthew Spring. Direct free kick taken by Christian Dailly. 88:27 Shot by Lloyd James from outside the box goes high over the crossbar. 85:29 David Mooney produces a cross, Radhi Jaidi makes a clearance. Corner taken by Jonjo Shelvey from the right by-line played to the near post, comfortable save by Bartosz Bialkowski. 84:52 Corner from the right by-line taken by Jonjo Shelvey, clearance by Wayne Thomas. 82:36 Effort from deep inside the area by Luke Holden misses to the left of the target. 81:27 Substitution Jacob Mellis on for Michail Antonio. 80:06 Foul by Ndiaye Papa Waigo on Luke Holden, free kick awarded. Jonjo Shelvey crosses the ball from the free kick right-footed from right wing, clearance made by Lloyd James. Inswinging corner taken right-footed by Jonjo Shelvey from the left by-line to the near post, Radhi Jaidi manages to make a clearance. 78:36 Wayne Thomas crosses the ball. 76:33 Shot by Deon Burton from deep inside the penalty area misses to the left of the goal. 75:30 The referee blows for offside against Neal Trotman. Free kick taken by Carl Ikeme. 74:50 Unfair challenge on Lloyd James by Deon Burton results in a free kick. Wayne Thomas restarts play with the free kick. 71:25 Booking Christian Dailly receives a caution. 69:48 Grant Basey crosses the ball, Neal Trotman manages to make a clearance. 68:17 The offside flag is raised against David Mooney. Bartosz Bialkowski takes the free kick. 67:40 Substitution Scott Wagstaff goes off and Leon McKenzie comes on. 66:23 Free kick awarded for a foul by Richard Lambert on Miguel Angel Llera. Christian Dailly takes the direct free kick. 65:39 Substitution Deon Burton is brought on as a substitute for Jose Vitor Semedo. 63:40 The assistant referee signals for offside against David Mooney. Bartosz Bialkowski takes the indirect free kick. 62:40 Assist on the goal came from Adam Lallana. 62:40 GOAL - Richard Lambert:Southampton 2 - 0 Charlton Richard Lambert scores a goal from just outside the area to the bottom right corner of the goal. Southampton 2-0 Charlton. 61:18 David Mooney takes a shot. Save by Bartosz Bialkowski. Outswinging corner taken by Scott Wagstaff from the right by-line played to the near post, clearance made by Dean Hammond. The offside flag is raised against Miguel Angel Llera. Bartosz Bialkowski restarts play with the free kick. 60:02 Corner taken by Lloyd James, Radhi Jaidi challenges Miguel Angel Llera unfairly and gives away a free kick. Free kick taken by Carl Ikeme. 59:08 Ndiaye Papa Waigo takes a shot. Brilliant save by Carl Ikeme. Outswinging corner taken by Lloyd James, Adam Lallana takes a shot. Blocked by Matthew Spring. 58:43 Matthew Spring has shot on goal from just outside the box which goes wide of the right-hand upright. 57:40 Substitution Ndiaye Papa Waigo on for David Connolly. 55:00 Substitution Lloyd Sam leaves the field to be replaced by Luke Holden. 55:00 Shot from deep inside the area by Richard Lambert clears the crossbar. 54:02 The assistant referee flags for offside against David Mooney. Free kick taken by Bartosz Bialkowski. 53:15 The ball is crossed by Jonjo Shelvey, Radhi Jaidi manages to make a clearance. 52:54 Michail Antonio delivers the ball, Richard Lambert takes a shot. Miguel Angel Llera gets a block in. 52:07 The assistant referee signals for offside against Lloyd Sam. Indirect free kick taken by Bartosz Bialkowski. 51:25 A cross is delivered by Lloyd Sam. 49:26 The ball is swung over by Grant Basey, clearance by Radhi Jaidi. 48:10 Scott Wagstaff fouled by Adam Lallana, the ref awards a free kick. Grant Basey takes the direct free kick. 47:14 The ball is swung over by Kelly Youga, Neal Trotman manages to make a clearance. Correction - 45:01 Substitution Neal Trotman joins the action as a substitute, replacing Morgan Schneiderlin. 45:01 Substitution (Southampton) makes a substitution, with Neal Trotman coming on for Morgan Schneiderlin. 44:50 Lloyd Sam gives away a free kick for an unfair challenge on Michail Antonio. Direct free kick taken by Lloyd James. 42:53 Dan Harding sends in a cross. 41:28 Free kick awarded for an unfair challenge on Morgan Schneiderlin by Miguel Angel Llera. Morgan Schneiderlin takes the free kick. 40:33 Free kick awarded for a foul by Scott Wagstaff on Adam Lallana. Direct free kick taken by Bartosz Bialkowski. 38:14 Effort from inside the box by Michail Antonio hits the post. 36:26 Kelly Youga challenges Morgan Schneiderlin unfairly and gives away a free kick. Free kick taken by Dan Harding. 35:20 David Connolly has an effort at goal from just outside the box which goes wide of the left-hand post. 33:01 Assist on the goal came from Lloyd James. 33:01 GOAL - Wayne Thomas:Southampton 1 - 0 Charlton Wayne Thomas grabs a goal from inside the six-yard box high into the middle of the goal. 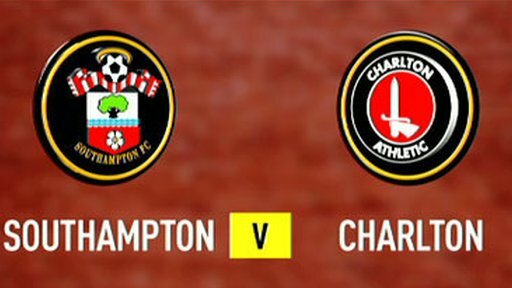 Southampton 1-0 Charlton. 30:28 Free kick awarded for a foul by Grant Basey on Michail Antonio. Dan Harding crosses the ball from the free kick left-footed from right wing, save by Carl Ikeme. 27:49 Free kick awarded for an unfair challenge on Scott Wagstaff by Adam Lallana. Free kick taken by Kelly Youga. 24:54 Unfair challenge on Lloyd Sam by Dean Hammond results in a free kick. Jonjo Shelvey delivers the ball from the free kick right-footed from left wing, Radhi Jaidi manages to make a clearance. 23:36 Matthew Spring takes a shot. Blocked by Radhi Jaidi. Corner taken left-footed by Grant Basey, Wayne Thomas manages to make a clearance. 21:38 Scott Wagstaff takes a shot. Save made by Bartosz Bialkowski. Free kick awarded for a foul by Miguel Angel Llera on Richard Lambert. Direct effort from the free kick comes in from Richard Lambert. 17:36 Foul by Richard Lambert on Christian Dailly, free kick awarded. Free kick taken by Carl Ikeme. 17:00 Foul by Jonjo Shelvey on Adam Lallana, free kick awarded. Direct free kick taken by Lloyd James. 15:50 Free kick awarded for a foul by Morgan Schneiderlin on Scott Wagstaff. Christian Dailly takes the free kick. 14:03 The offside flag is raised against David Mooney. Bartosz Bialkowski takes the free kick. 13:23 David Connolly has an effort at goal from just outside the box which goes wide of the left-hand upright. 13:02 Lloyd Sam produces a cross, Bartosz Bialkowski makes a comfortable save. 11:46 A cross is delivered by Michail Antonio. 10:52 Centre by David Connolly, Adam Lallana has a header from deep inside the six-yard box and clears the crossbar. 9:45 The ball is sent over by Michail Antonio, Christian Dailly makes a clearance. 9:00 Centre by David Mooney, comfortable save by Bartosz Bialkowski. 8:25 David Mooney fouled by Wayne Thomas, the ref awards a free kick. Jonjo Shelvey takes the free kick. 7:26 Kelly Youga concedes a free kick for a foul on Richard Lambert. Free kick taken by Dan Harding. 4:37 Lloyd James delivers the ball, clearance made by Jose Vitor Semedo. Corner taken right-footed by Lloyd James, save by Carl Ikeme. 3:43 Dean Hammond has an effort from just inside the box that misses to the left of the goal. 3:16 Unfair challenge on Dan Harding by Matthew Spring results in a free kick. Direct free kick taken by Bartosz Bialkowski. 1:04 Centre by Michail Antonio, Grant Basey gets a block in. Outswinging corner taken from the right by-line by Lloyd James, Dean Hammond has a headed effort at goal from deep inside the area missing to the left of the target.